In summary, it can be said that the healing process in NFC implants is no more than an ordinary piercing or body modification. Provided one does not define artificial ears and split tongues as usual. Let’s go into detail and look at the individual process sections. This image was taken immediately after NFC implantation. 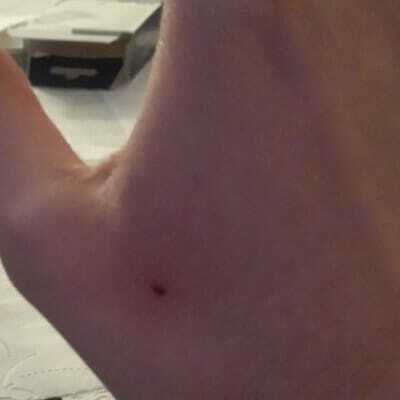 The approximately 2.5 mm puncture wound is clearly visible. 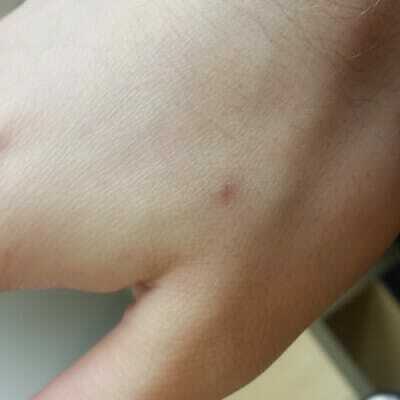 The wound is still open and bleeding a bit – comparable to a scratched mosquito bite. 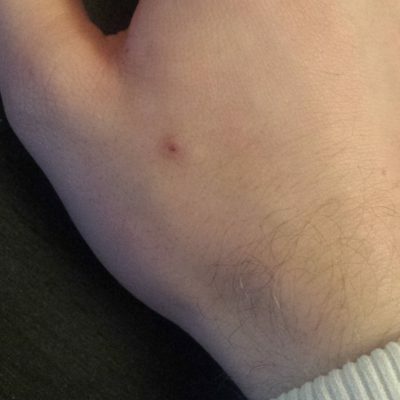 If small veins have been injured with the needle tip, it is possible that the skin turns a little bluish. However, this happens after a few hours. Then the wound should also have closed. In this healing process, an air-permeable patch should still be worn to prevent infection. When showering, a waterproof plaster should definitely be worn. Low numbness may arise about 3cm around the puncture wound, as a small swelling may form. 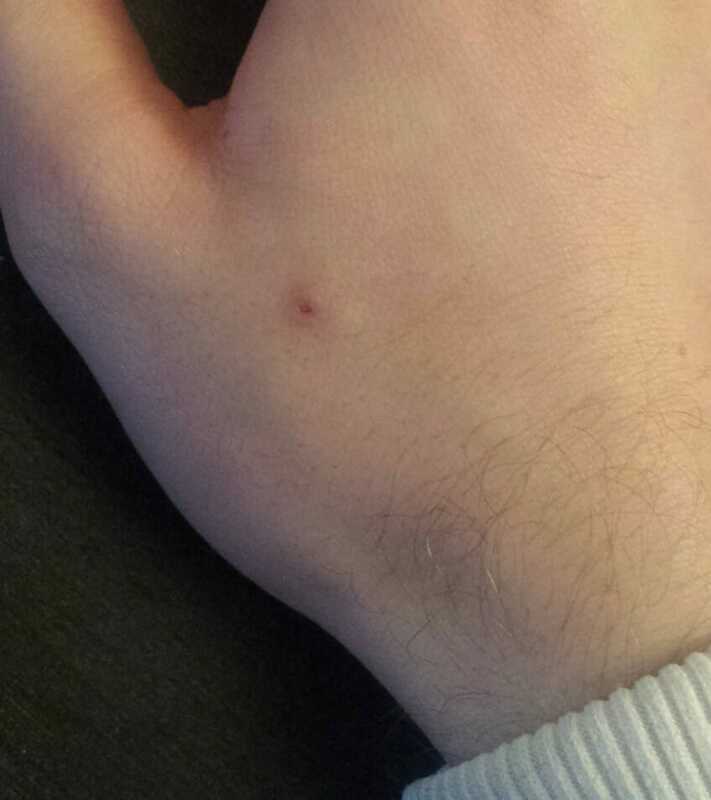 After a day, a small crust forms directly on the puncture wound and around it the skin is still a little red. The swelling decreases after the first few days, reducing “knocking” and numbness. We strongly recommend that you do not move the implant underneath the skin as the tissue is still very irritated by the puncture. A patch is no longer necessary at this stage, since the skin is closed and therefore no bacteria or similar. can penetrate more. This picture is taken 3 weeks after an implantation. The crust is almost completely gone. Foreign body feelings are no longer present. 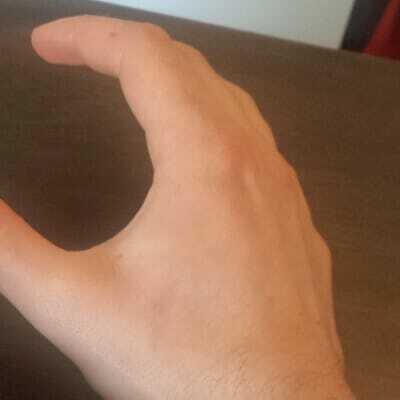 The NFC implant is no longer felt in unusual hand movements. Since the swelling has also decreased, the NFC implant can be moved slightly under the skin, because the implant has not entered into any connection with the tissue, it is free under the skin. Scarring also develops in this healing process. If the crust has completely disappeared, a scar that is about 1 mm small remains, but you hardly notice it at all, as in the following picture. After 6 – 8 weeks, the final stage is reached and the wound is completely healed. The healing process shown here is based on customer statements and own experiences. The healing can develop differently for everyone!